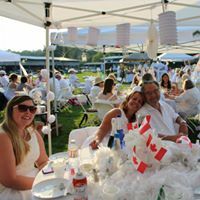 A fun-filled fund raiser, Dinner in White is the runaway hit of the season! With a secret location revealed only hours before, the suspense is rivalled only by the experience of this exciting, sophisticated Pop-up Picnic! Thank you to all who came out and made this years Dinner in White another wonderful event! We couldn't do it without the support and enthusiasm of our wonderful Community. A huge thank you to all our Sponsors and Donors, who contributed to the Silent Auction Table.